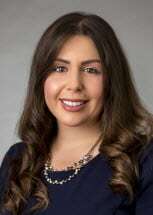 Stefanie Lynn DeMario is an associate in the firm’s Elder Law and Estate Planning Group. Her areas of concentration include estate planning, probate and estate administration, as well as Medicaid planning and applications. Ms. DeMario assists clients in protecting current assets with an eye towards the future. Her expertise in Medicaid rules and regulations allows for success in both emergency and structured Medicaid planning. Ms. DeMario is admitted to the New York State Bar, the New Jersey Bar and the United States District Court of New Jersey. She received a Juris Doctorate from New York Law School. A St. John’s University alumna, she earned her Bachelor of Science degree while serving as the President of the University’s Moot Court Association and maintaining Dean’s List status. Ms. DeMario serves as the co-chair of the Staten Island Chamber of Commerce’s Young Professionals Group as well as the Secretary of the Chamber’s Business Guild III. She is also the Young Lawyer's Section Co-Liaison to the Elder Law Section of the New York State Bar Association. Her professional associations also include Richmond County Bar Association, the American Bar Association, the New Jersey Bar Association and New York County Lawyers Association.